According to Australian Greenhouse Office, energy consumption in Australia will increase by 60% from 1990 to 2010. Almost 40% of energy used in households is for space heating and cooling. It is believed that these numbers are even higher in other developed countries with climate not as mild as Australian. There is a great potential to achieve significant savings in energy consumptions, costs, greenhouse effect etc. by increasing passive solar efficiency of structures including brick walls. 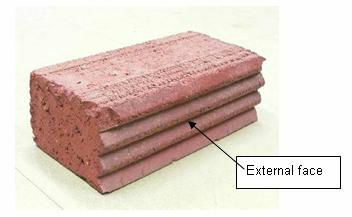 A new design for brick with built in passive solar efficiency was developed at the University of Newcastle, Australia. This brick absorbs more heat in winter because the external area of the brick exposed to solar radiation is significantly increased in comparison to a conventional brick and also because of reflection. It also absorbs less heat in summer because the area exposed to direct sun is significantly reduced.